Waitlisting allows you to “get in line” for a closed undergraduate class and receive an email if a spot opens. Once notified of an open seat, you must officially register for the course in Cyberbear. If you don’t register within 72 hours, you will be dropped from the list, giving the next student the option to register. If the class is full, you will get a Registration Add Error that says “Closed – ## Waitlisted”. You now have the option to add to the waitlist. Choose “Wait List” from the dropdown menu then click the “Submit Changes” button. Your schedule will reflect your addition to the list and you must now wait for an opening. Once a spot opens, you will receive an email to your UM email address prompting you to return to this screen to officially register. You can see the actual size of the waitlist by searching for the course in Cyberbear and referring to the “WL Act” column. Classes without a waitlisting option display zero in all three “WL” columns. I tried to add an open class but Cyberbear says “Open- Reserved for Waitlist.” Why? Although the class appears to be open, the “open” spot is reserved for a student already on the waitlist. The waitlisted student is in the midst of the 72 hour time limit to register for the open spot. You may add yourself to the waitlist. Why can’t I add myself to a waitlist? Some linked classes don’t have waitlists. Lecture courses with a mandatory discussion group or lab (i.e. M 115, CHMY 141N) may allow you to waitlist only for the lab or the lecture. Once a spot opens for the section you waitlisted, add the CRN for the link at the same time you register for the open spot in the waitlisted class. Usual restrictions must be cleared first. Major, class, pre-requisite, college errors, etc. must be cleared with the corresponding paper or electronic override. It’s a 500 or 600-level graduate course. Currently, graduate-level courses are not included in waitlisting. The enrollment cap must be overriden with a paper Registration Override form. Can my instructor just override the waitlist? Not until the first day of the semester. 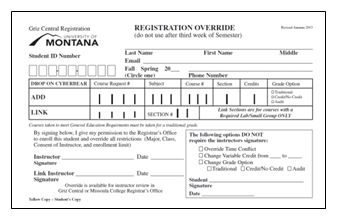 If you submit an override slip to the registration counter prior to the first day of class, we will override any usual restrictions and add you to the waitlist. In very unusual circumstances, the Dean of your School or College may request override capabilities. But my instructor said it was okay because I need it to graduate! What can I do? If you have made an agreement with an instructor, he or she may choose to grant you an override on the first day of the semester if you’re still on the waitlist. In the meantime, we recommend you remain on the waitlist and pick an alternative if you have one. How will I know if a spot opens? You will receive an email to your UM account. You must officially register on Cyberbear within 72 hours or you will be removed from the list and the seat will go to the next person in line. You will receive only ONE notification so check your email regularly. How do I add the class after I am notified of an open spot? Return to “Register/Add/Drop Courses” in Cyberbear to view all your registered and waitlisted classes. Select “Register” in the dropdown box next to the waitlisted course. Click “Submit Changes” at the bottom of the screen. The course status should switch to “Registered.” Remember to add any required linked or co-requisite classes at the same time to avoid an error. I missed my 72 hour window, but I still want the class! What can I do? If you miss your window, you may add yourself to the waitlist again but you will be last in line. Where am I in line for a waitlisted class? You position on the waitlist for a course can be found in the Register for Classes section on the bottom left under the Schedule Details tab within the Message line. I decided I no longer want to be on a waitlist. How can I remove myself? Return to “Register/Add/Drop Courses” in Cyberbear to view all your registered and waitlisted classes. Choose “Drop/Delete” from the dropdown box next to the course and click “Submit Changes.” You may remove yourself any time and are encouraged to do so if you are no longer interested in the class. It’s the first day of class and I’m still on the waitlist. Should I go to class? YES! Depending on the instructor, you may be able to override into the class. Overrides are granted at the discretion of each instructor, but your chances are better if you prove your interest by attending. Just in case, it may be helpful to bring a paper override with you to class. If I turned in an override slip before classes started, do I have to turn in another slip if the instructor said I could be in the class on the first day? Yes, unless the instructor opts to use the electronic “closed override” which becomes available the first day of class. This provides proof of the instructor’s permission and gives him or her control over which students can be in the class if there aren’t enough seats in the classroom to meet the demand. Do waitlisted classes counted toward my credit hours? No, they do not count toward your credit hours which means you are not charged for these credits and cannot be considered for financial aid purposes. Once a spot opens and you officially register for the course, the credits will be added to your account and billed accordingly. Can I waitlist for classes that would put me over the 21 credit maximum? You may add yourself to a waitlist, even if that class that will push you over the maximum credit hours for the semester. However, if a spot becomes available, you must drop one of your other courses or turn in a Max Credit slip to the registration counter before you can officially add the class.